In 1928, US 1 entered Washington via Bladensburg Road, and then followed Maryland Avenue to the Potomac River. By 1964, US 1 was rerouted so it entered Washington via Rhode Island Avenue. From there it went to 6th Street, Constitution Avenue, 15th Street, and across the George Mason Memorial Bridge. In 1977, US 1 was rerouted so that from 6th Street, it turned onto L Street, then onto 9th Street to the Southwest Freeway (I 395). 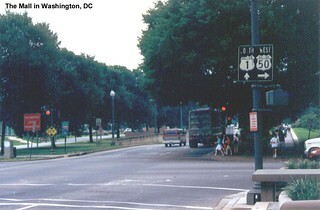 Photos of old US 1 shields in Washington, DC can be found on Steve Alpert's Roads website.